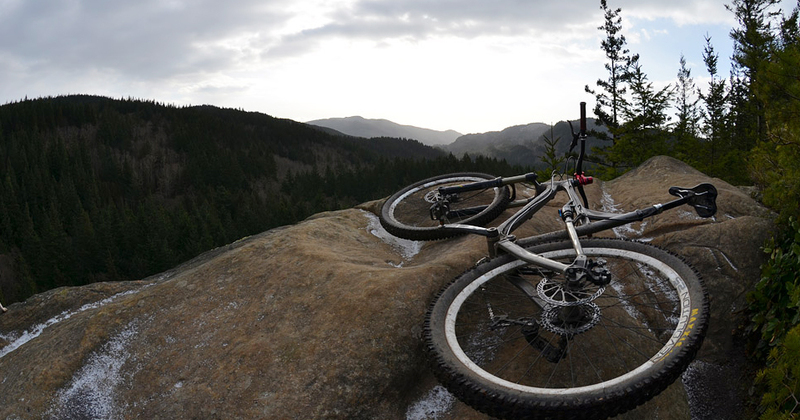 The Chuckanut Mountains are some of the most scenic trails in our area. Rising straight out of the ocean, the mountains boast a massive amount of old growth forests with some of the best views around. The trails wind in and out of Larrabee state park and are primarily hiking trails that allow mountain biking on designated trails. The trails offer a massive amount of vertical for those not afraid to climb along with great views and extremely high quality flowy singletrack. The best way to experience the Chuckanuts is to go with someone that knows the area or get a hold of one of the Chuckanut Maps available at your local Bellingham bike shop, running store, or REI. There is a tremendous possibility to get lost and end up a long way from where you parked if you don’t know where the trails are leading you. The map will specify if bikes are allowed on trail since many are hiker only. Our favorite bike trails are: Raptor Ridge, The Ridge Trail, Salal, Double Black, Double Down, Hemlock, Hush Hush, Pine and Cedar. There are three main ways to access the Chuckanut mountains, the Arroyo Park entrance, Cleator Road and Fragrance Lake Road. All the access points are off of Chuckanut Drive. The Arroyo Park has a parking lot right off of Chuckanut Drive next to California St. Cleator road goes all the way to a view point where you can access trails in the Larrabee State park. The Fragrance Lake Road access is via the Clayton Beach Parking lot just south of Larrabee State Park.